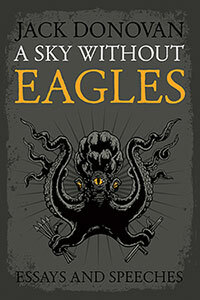 A Sky Without Eagles is Jack Donovan’s eagerly anticipated follow-up to The Way of Men  (2012) – which has now sold an astonishing ten thousand copies. This anthology collects a number of essays and talks Donovan has given since 2010. In the earlier essays we encounter glimmers of the ideas that later wound up in The Way of Men. And in the essays written since that book’s publication we find him developing and expanding upon those ideas. It therefore seems fitting to begin with a very brief summary of the argument of The Way of Men. Eschewing all the fashionable, politically correct claptrap about “redefining masculinity” (i.e., feminizing it) Donovan suggests an ingenious thought experiment designed to lay bare the core of what real manliness consists in. Let us cast our minds back to what life would have been like in the most ancient and primitive of human societies. They would have been concerned with very little more than surviving day-to-day. Since men are physically stronger and more aggressive than women, they would naturally have assumed the role of hunters and warriors (i.e., defenders of the territory, and of the women and children, against outsiders). Needless to say, the men of the tribe would have to have banded together in order to play this role. And it is when they formed together in such bands (which Donovan simply calls “gangs”) that masculine virtue must first have manifested itself, and been reflected upon, and cultivated consciously by men. How do we know what those primal masculine virtues were — i.e., what was primal, authentic masculinity? Simple. They would have been the qualities men had to have possessed in order to be defenders of the tribe. As I pointed out in my review  of The Way of Men: “nobody thinks Martha is less of a woman if she needs help changing a tire. We never observe physical weakness in a woman and think ‘she’s unwomanly.’ Sally may defeat Martha in an arm-wrestling contest, but no observer thinks ‘Wow, Martha isn’t half the woman Sally is!’” Result? Strength, courage, mastery, and honor are not just the primary masculine virtues – they are primarily masculine virtues. You will have to read The Way of Men to get the rest, including Donovan’s extensive discussion of the four virtues. Really, it’s a brilliant book and it is clearly making an impact within the “manosphere” and without. Indeed, much of Donovan’s writing has been devoted to an analysis of the sorry state of modern American manliness, and its causes. “Everyone a Harlot” is the essay that probably best typifies this strand of Donovan’s thinking. It is tucked roughly in the middle of the anthology. With a great deal of wit and incisiveness, Donovan here skewers the repulsive narcissism of today’s “new masculinity”: “No one cares how much Tatum Channing [sic] or Brad Pitt lifts, or how fast they can run, or what they can build, or how many men they could defeat in combat. They’re admired for being desirable” (p. 90). Today’s typical “metrosexual” male sees this and aspires to be desired as well. He desires the desire of others, and that is all. For him, this is achievement enough. There’s an easy transition from this essay to “Train for Honor,” which was written especially for the volume (and is one of my favorites). When the metrosexual works out he is merely building muscle in order to be sexually desirable. But Donovan states, correctly, that this makes him fundamentally effeminate: no different from women concerned with getting their makeup right, showing off their cleavage, and making sure they are not badly lit. Again, no one thinks less of women for doing this, because femininity consists, fundamentally, in two and only two elements: being attractive to men, and being nurturing (to children and others). Homosexual men, Donovan points out, were the vanguard here. Think of the “gay clone look” of the 1970s and ’80s, which essentially involved creating a hyper-masculine, blue collar, “tough guy” look (mustache, sideburns, Levis, leather, work boots, etc.) – sans any underlying, achieved masculinity or actual blue collar toughness. The metro/homosexuals hit the gym in order to be desirable (hence “everyone a harlot”). But why else should we work out? Most modern people don’t need big muscles, or the ability to run fast. It’s seldom that I am called upon to carry a wounded comrade on my shoulders, or to outrun a hungry cheetah (which is probably impossible anyway). “Ah,” some may say, “we must make ready for the coming collapse! For the war of all against all, when we’ll be stalking elk through the damp forests around the ruins of Rockefeller Center, wearing leather clothes that’ll last the rest of our lives, and climbing the wrist-thick kudzu vines that wrap the Sears Tower.” Or something like that. But this may just be wishful thinking; it might never happen in our lifetimes. Donovan writes, “the male machine wants, at the apex of its potential, to be hurled in a warp spasm of muscular inertia at danger and, ultimately, death” (p. 110). Few of us are able to fulfill that potential, in the real and true sense. So instead we hurl ourselves at barbells and treadmills, at CrossFit and jiu-jitsu. No external signs may distinguish the man on the treadmill who trains for honor, and the gay or straight queen on the treadmill next to him, who trains to be “hot.” What counts is the motivation or the mindset they bring to their training. This is a very interesting statement, and it dovetails nicely with the final essay in the volume, “The Brotherhood.” It’s the final essay here but not because it is least important; arguably it’s the most important one of all, and it appears in print for the first time. Donovan describes The Brotherhood as “my sacred, guiding dream” (p. 152). What it is, quite simply, is the Männerbund: a voluntary alliance (or, as he puts it – significantly – “voluntary kinship”) between men based on honor – though there is a bit more to it, as we will see. In modern society, brotherhoods have almost completely disappeared. War is reserved for professional soldiers, who see themselves (or are told to see themselves) as fighting for the preservation of the family – women and children, in other words. In days of yore, however, it was the Brotherhood that took a special kind of preeminence over family. Now, if we recall the argument of The Way of Men, we may be puzzled by these ideas. After all, didn’t Donovan tell us that male bands originate from the need to protect the vulnerable members of the tribe and its territory – and didn’t he tell us that this is the way that masculine virtue first manifests itself? Yes, but the important thing to understand here is that while the Männerbund may originate in this way, it becomes – for its members – an end in itself. And those masculine virtues that are supposed to be cultivated by the members become ends in themselves. Of course, if the Männerbund became, in some fashion, antagonistic towards the tribe and the family, it would become a perversion of itself, and a cancer in the tribe. For, as Donovan notes, “without family, the Brotherhood has no future. The family is the second most sacred idea. The family is a means for the continuation of The Brotherhood, and gives a sacred role to women in The Brotherhood” (p. 153; i.e., because women give birth to the men who make up the Brotherhood, they have a sacred role to play in the tribe). With his insistence that the family exists for the sake of the Brotherhood, Donovan turns modern reductionist biology on its head. His position is not unlike that of Hegel: the end of nature is to give rise to Spirit. The perfection of the human being is the realization of the ideal, but this happens in overcoming nature, including the nature in us. We begin as “natural beings,” but we become truly human when we turn ourselves towards the ideal and are willing to risk our bodily being in the service of it. For Hegel, this first displays itself in the struggle over honor. For Donovan, honor is an ideal that is first realized in the Brotherhood. The Brotherhood begins as something in the service of the natural (protection of women and progeny) but then disengages itself from the natural. It is in the Brotherhood that consciousness of the ideal is formed. It is in the Brotherhood that what is truly human is born. And later he restates the Brotherhood’s triad of values as “The Brotherhood, The Family, and the Dead.” The members of the Brotherhood must look to who has come before them, to their ancestors. They must honor them, must become worthy to carry their name. Recall that Donovan tells us he trains “to be less of an embarrassment” to his ancestors. And – significant words here – “I train ‘as if’ I might one day be called to join them.” The members of the Brotherhood see themselves as one with the dead. And in real warrior Brotherhoods, they go out each day prepared to die – as if they were already dead. And they act with full awareness of trying to live a life worthy of being recalled in fables and songs. Their future is consciously constituted in relation to their past: the past of their ancestors, and the “past” they would create for themselves, in the memory of others. But why anarcho-fascism? Short answer: think Fight Club. Traditionally (with a capital T), The Brotherhood is a fascistic Männerbund bringing fascistic order to the tribe or nation. Today, the Brotherhood is – or must be – a fascistic “gang” (to use Donovan’s favored term) existing in “anarchic opposition” to the feminized, degenerated modern world. “Manhood can only be rebooted by the destruction of their future, and the creation of new futures for new or reborn tribes of men. . . .The way of men can only be rediscovered in Night and Chaos” (pp. 44-45, my italics). Shades of Hesiod in that last bit. Donovan is saying we must crank it all back to the beginning. This is a passage pregnant with significance. Through the Brotherhood, culture is created. These were the men who painted the caves  in the Upper Paleolithic. From “manly honor,” that one small, noble seed, has sprouted the mighty ash of the human spirit, with its three great branches: art, religion, and philosophy. Through the Brotherhood, a people constitutes its culture, and knows itself. The Brotherhood is the pride of the tribe, embodying its highest values. The Brotherhood is the holy of holies at the center of the nation. Donovan writes: “The blood of dire necessity that binds the band of brothers becomes the blood of heritage and duty that ties the family, the tribe, the nation” (p. 42). Arising from natural necessity, the Brotherhood forms itself. Its members must exhibit and cultivate certain virtues. These values thus come to be reflected upon, theorized, and represented in stories and songs. And they come to be personified. They become, in short, the stuff of myth, which is the foundation of Tradition. It would be incorrect to say that these ideals become “objectified” or “hypostatized,” because these ideals are already real, already objective. But that is a tale for another time. Briefly: through the Brotherhood, men do not “make up” ideals and they certainly do not “make up” gods. They become aware of them. The gods are as real and as objective as the Pythagorean Theorem (and no more so – though they are closer in nature to the dynamic logoi spermatikoi of the Stoics, than to Pythagorean or Platonic ideas). Donovan’s Brotherhood, fully actualized, is always a religious brotherhood. It is always, consciously or unconsciously, oriented toward the ideal – toward the divine. But its awareness of the divine is always simultaneously its own self-awareness. This brings us to Crom. “Crom” is the title of another of the essays written especially for this volume, and it’s the second to last essay (before “The Brotherhood”), which has got to mean something as well. Crom is the fictional god in Robert E. Howard’s Conan stories. And this is Jack Donovan’s god – or so he says, but his tongue is in cheek here (sort of). In the preface, he tells us that this essay “pretty well sums up my ‘spiritual’ perspective.” And earlier I quoted him telling us that “I have never been a believer or a religious man.” Well, in the conventional sense of “believer” and “religious” man, yes. But in the unconventional sense Donovan definitely qualifies as God-intoxicated. Donovan is actually pretty serious about Crom. He’s had his name tattooed on his knuckles. If I had the name of someone’s fictitious god tattooed on my knuckles I’d have to be pretty serious about him. So, what does Crom offer the faithful? Nothing. And that’s precisely why he appeals to Donovan. Crom does not care about you. He does not think you are a beautiful and unique snowflake. If he thinks about you at all, however briefly, he considers you to be the same decaying organic matter as everything else. Because in his eyes we are all part of the same compost heap. Hmm. Sounds sort of like . . . Odin. But this isn’t really true. We are not entirely free to choose “whatever” story inspires us. The larger reason for this is that we’re never entirely free to do anything. Nurture and – more importantly, we’re finding out – nature (i.e., genetics) will pull us in certain directions. And Donovan admits that he finds himself pulled toward the “pagan European gods.” They are a better fit for him. But that’s not a matter of “choice.” So, why is he not sporting “ODIN” on his knuckles? Probably because so many self-proclaimed “Odinists” and “Ásatrúar” are basically just playing dress-up. Believe me, I understand that. But the genuine article is out there. I know, I’ve met some. (And I hope I am some.) And now, interestingly enough, Jack Donovan has met them as well. Around the time of the publication of A Sky Without Eagles Donovan journeyed to Lynchburg, Virginia to visit the Wolves of Vinland, a self-described “tribe of folkish heathens” – Odin-worshipping, Germanic heathens. I won’t summarize the result, because you can read about it yourself . I will simply say that I think the reader will come away with the same impression I did: that Mr. Donovan had a religious experience in Lynchburg. And if one reads A Sky Without Eagles with Donovan’s essay on the Wolves of Vinland in mind, as I did, it’s hard to resist seeing how the various strands of thought woven throughout these seventeen essays are all clues, leading Donovan back to the Northern European traditions of his ancestors. If we could go back far enough in Donovan’s lineage , we would find men who were members of precisely the sorts of brotherhoods he idealizes. Initiated members of Männerbünde, followers of Odin, the “first initiate” and the leader of the Männerbünde. Odin is a god beyond good and evil, who doesn’t “care about you.” And he is preeminently a god of self-overcoming. He is “the god of the battle ecstasy (of the ‘berserker rage’).” He only cares about valor. I don’t really want to bring down the modern world to save “men” in general. I do sympathize with the men of other tribes, in so far as men are men and have much the same problems and concerns. But it’s the men of my tribe that I am really concerned with — just because my primary concern is with the survival of my tribe and my culture. Jack Donovan has taught us that masculinity first displays itself in this concern with the survival of the tribe — of our tribe, not theirs; with “us” not “them.” Fundamentally, what he has taught us is that to be a man means to be at odds with the men of the other tribe. If Donovan really gets his way and “gangs” proliferate, they’re not going to all go bowling together. They’re going to begin history again. And it’s going to be intense. That this is Donovan’s own position is made crystal clear in this new volume. For I have not yet even mentioned what will be, for some, the most controversial of these essays: “Mighty White,” in which Donovan (sort of) endorses White Nationalism. The Brotherhood Donovan dreams of is not all shades of the rainbow. This completes the picture, as far as I am concerned. It’s safe to say that Donovan has earned himself a place at Odin’s table; membership in the einherjar. And Odin won’t even mind if Donovan still wants to call him Crom. For Odin has many names. This is not the same thing as saying that a woman has these two features and only these two. Women may achieve a wide variety of virtues, but the specific virtue of “femininity” consists primarily in these two aspects. Hans-Peter Hasenfratz, Barbarian Rites: The Spiritual World of the Vikings and the Germanic Tribes, trans. Michael Moynihan (Rochester, Vt.: Inner Traditions, 2011), 51. See Derek Hawthorne’s review  of Androphilia for another discussion of Donovan’s religious side.